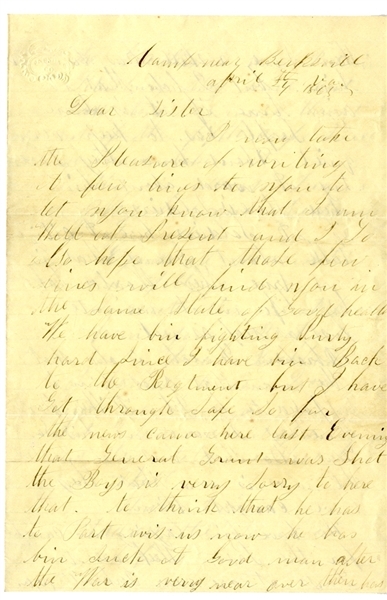 War-date Union soldier Autograph Letter Signed by John Bickhart, 55th Pennsylvania Infantry, 3pp. octavo, Camp near Burkesville, April 24, 1865, and reads in part: “...we have been fighting very hard since I have been back to the Regiment but I have got through safe so far. The news came here last evening that General Grant was shot...The people has to keep very quiet about how they don’t say a word about him where there is soldiers. If a soldier hear a citizen talk about Grant that is not true they would take his life in a minute...Abraham Lincoln is also shot. The man that shot him is John Wilkes Booth. Secretary Seward and his son was also shot but not killed. The news is now that they caught him....the Guerillas is very bad in Petersburg they have cut about 23 mens throats out of the fifth corps since we have taken it...” Fine condition.